Dimensions (HxWxD): 3.5" x 3.5" x 0.5"
This lovely bronze-gold Pyrite Power Bead Bracelet has a scant marbled pattern of black running through the beads, enhancing it's beauty. They are strung on elastic so that they will fit most any size wrist. 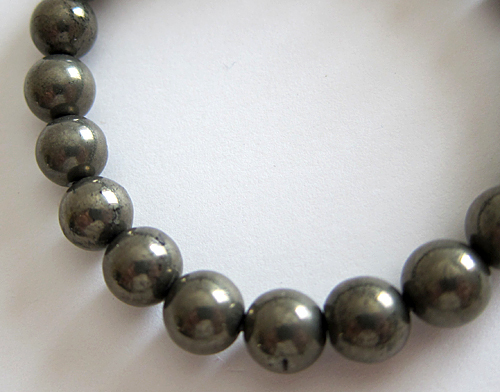 This is a fun bracelet to wear, and an inexpensive way to experience Pyrite, which can be very pricey. The average diameter of the bracelets are 3.5". Pyrite is a heavy metal, so these lovely bracelets weigh a little over one ounce each. Pyrite consists of very heavy, hard, yet fragile iron sulfide crystals, usually cubic or octahedral in shape. Pyrite is often yellowish in color, and displays a characteristic bronze colored metallic patina, or hardened sheen, created by the presence of iron oxide. Pyrite is often found in veins of gold-bearing quartz, but is located in all types of rock formations. Pyrite is known as "fool's gold" because it is often found in proximity with gold deposits, which also display a metallic sheen and yellowish coloration. Pyrite is associated with the root and third (navel) chakras, and is used by crystal healers and meditators to open and energize these two important centers of the human energy body. Pyrite works on the navel chakra to increase the flow of prana, or chi, or Universal Life Force Energy stored in the human body, because the storehouse of chi in the body is located in the hara center, two fingers width below the navel. Pyrite works on the root chakra to increase our sense of security, personal well-being and physical safety. Thus, metaphysically, pyrite is said to have powerful protective properties, shielding the bearer or the environment in which it is located from all negative and unwanted influences. According to Melody's excellent guide to healing crystals, "[Pyrite] is a unique protector and is an excellent stone to keep in one's possession when performing dangerous work; it helps to keep away all forms of negative vibrations and can work to allay physical danger." In addition, because of its connection to the third, navel chakra, pyrite is said to increase the flow of Universal Life Force Energy within the physical body and the meridian system joining the physical and the etheric bodies, working to optimize physical health and well-being. Pyrite facilitates understanding of the inherent perfection with all of creation, including one's own being. Pyrite is often used by crystal healers to reduce fevers and inflammation, treat lung disorders and violent or highly infectious disease, and to protect those who work with infectious individuals from becoming ill. Note: weight above is shipping weight. Net weight of each bracelet averages 31 grams or 1.09 oz.